Well we did it! We found the Great Grey Owl while birding at Sax-Zim Bog in Minnesota last weekend! With a little help from the Sax-Zim Bog Facebook group where people commented about their sitings, we were able to spot this guy (video above) hunting for breakfast at 7:15 AM last Saturday morning. By we I mean me, my husband Jeff, my sister Diane, and her husband Andy and my Millie Dog and Darbey, my sister’s dog. We had only two days to find him… Friday and Saturday. On Friday morning at 7 AM we started our trek with a whopping -8 degrees and added wind chills to make it even more interesting… BRRRR!!!! We searched practically all morning and continued throughout the day looking for this elusive owl. Of course there were other birds to look for too. 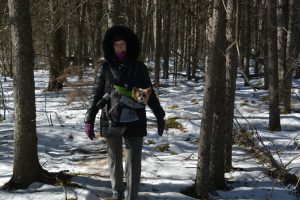 We have a check-off list you see (Jeff’s) and the goal was to find a Boreal Owl, Hawk Owl, Boreal Chickadee, Black-capped Chickadee, Hoary Redpolls, Evening Grosbeak, Pine Grosbeak, Three-toed Woodpecker, Black-backed Woodpecker, Gray Jays, and some other birds of the bog (see photo of Jeff’s list to the left—Green Ones mean lifers – we never saw them before). 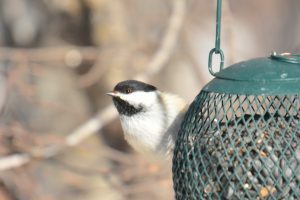 We were successful finding many of the birds on our list that we wanted to see with the exception of the Boreal Owl and the Boreal Chickadee. That was kind of a disappointment but still we didn’t do too bad. How were we able to locate all of our targeted birds? 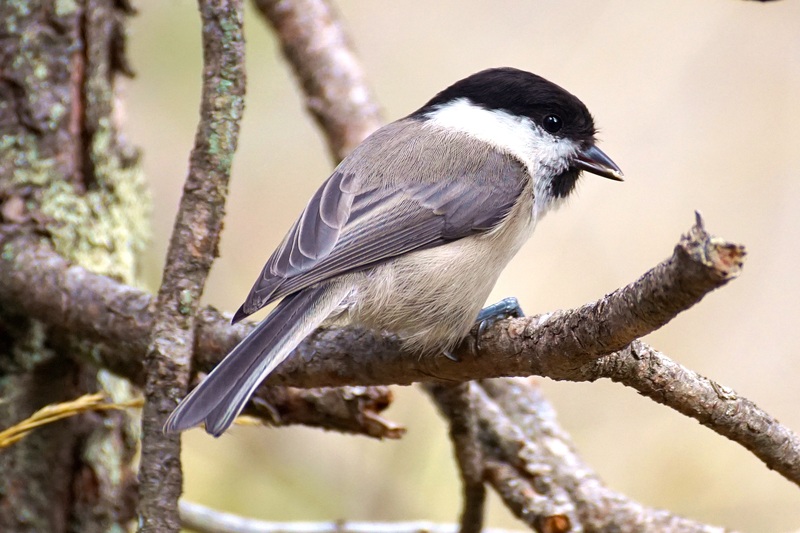 The Sax-Zim Bog welcome center has a map that they provide for you showing specific locations of where to find certain birds according to their specific habitat (you can also download the map off of their website). With that as our guide we would travel on either dirt, gravel, or paved roads searching for a specific bird. People do live in and around the bog so you have to be respectful of their properties. However, there are a few who allow you to stroll around their property and observe their multiple feeding stations. I really enjoyed that as you could see some of the birds up close and personal. Mary Lou’s place was the best! That is where we got to see the Evening Grosbeaks, Pine Grosbeaks, and Black-capped Chickadees. Sax-Zim Bog is located in Toivola, Minnesota about fifty miles north of Duluth where we stayed. Toivola is where the Welcome Center is. The Bog covers about 200 square miles and is part of the Lake Superior Watershed. You will find a good variety of evergreen trees such as white spruce, lowland spruce, norway pine, and jack pine and also aspens and birch trees. Added to that is farmland, sedge meadows, and hay fields along with a few lakes and streams to go with it. This is all great habitat for wintering boreal birds coming from up north. The best birding time in this season is December through February. This is the place that serious birders go to spot Great Grey Owls, Boreal Owls, Boreal Chickadees, and many other birds that you may not see anywhere else in the United States. They say that every year is different there too. Some years you may have an irruption of Great Grey Owls and they will be plentiful. My brother-in-law was there a few years ago and was able to see 100 or more of them in just two days. An irruption happens because Great Grey Owls are in search of food which is not as plentiful in their boreal breeding grounds. Other birds such as the Snowy and Boreal Owls may or not be as plentiful in some years either. It all depends on their food supply just like the Great Grey. 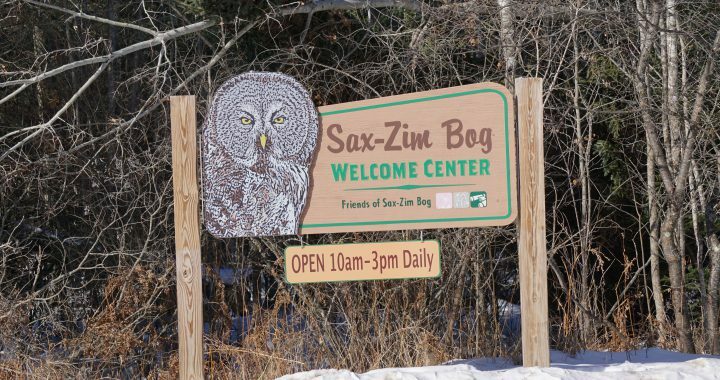 Winter time isn’t the only time to go to Sax-Zim Bog. In mid May migrating warblers move through and the breeding birds are in full swing most of June and part of July. It took us twelve hours to drive from Northern Kentucky to Sax-Zim Bog in Minnesota but it was definitely worth it. We were lucky enough to observe a Great Grey Owl hunting one morning (no one else was there but us) and I even got a great video showing it capturing a vole? which was underneath the snow. Their hearing is so good that they can detect these critters underneath up to two feet of snow. If you watch my video you will notice how it listens, focuses, and takes aim on its breakfast and then blindly grabs it out of the snow! I think that is amazing! There are plenty of other birds to see at Sax-Zim Bog too that are winter visitors from way up north. From about mid-December through February, many birders and photographers like to come to the Bog to catch a glimpse or a great photo of rare birds not seen anywhere else in the United States. Birding in the Bog or anywhere for that matter can be a hit or miss thing too. You are never guaranteed that you will see every bird species that is there at the time. It takes a lot of luck and patience. Some years are better than others too. Some years there could be an irruption of a certain species because food supplies are low up north where the bird resides. Owls such as the Great Grey, Snowy, or Boreal (not necessarily at the same time) could be abundant and you may be lucky enough to see fifty to one hundred of them or more in the Bog. Birders love that! Oh and did I mention the mammals that you could see? There are bobcats, martens, moose, deer, and ermine to name a few. 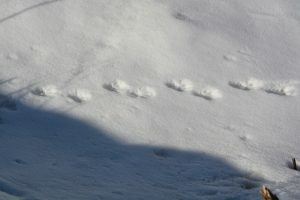 Honestly, all we saw were deer and Jeff did find some ermine tracks at the welcome center. So check it out sometime I guarantee you will enjoy it as much as we did. Added Note: And if you have a long drive like we did you can count hawks on your way home to keep it more interesting…… Our count: 99 Red-tailed Hawks, 6 Rough-legged Hawks, 5 Red-shouldered Hawks, and 3 dead hawks of some kind. We thought we had our 100th Red-tail but it turned out to be a Barred Owl instead. I will take that! 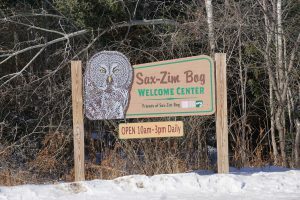 Have you ever been to Sax-Zim Bog, Minnesota? Or do you have any comments about this post? I would love to hear from you…please feel free to comment below. Posted in Birding Hotspots, Owls. Sax-Zim Bog looks like a beautiful place to visit and the images of the birds and in particular, the Great Grey Owl are awesome. Owls are one of my favorite birds of prey. I live in the Appalachian Mountains in North Carolina and the bird watching here is great. I grew up in the Florida Keys and the tropical birds are numerous and beautiful. You should take a trip some time and see for yourself. The drive through the Florida Keys is stunning as well! Jack, thanks for your comment! I agree with you, the Florida Keys are a great place to see tropical birds. My husband and I have also been to Dry Tortugas twice and we love it! Check out my post on Florida Birding. http://abirdsdelight.com/top-1… North Carolina is great too! Thanks again!